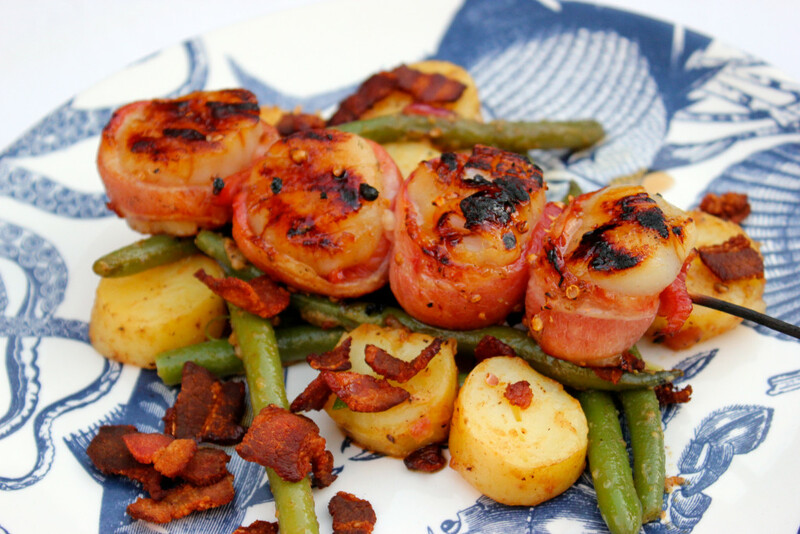 Course ground toasted coriander and agave syrup make a slightly spicy sweet glaze brushed over bacon wrapped scallops! The salty bacon tempers the sweet agave, and the plump juicy scallops make a great skewer. I served them along with a warm potato salad of fingerling potatoes and fresh crisp green beans with a bacon apple cider dijon mustard vinaigrette, but you could serve them with any side you like. In a small pan, add the whole coriander, and black pepper and toast on medium heat for about 2 minutes, to release their oils. Pour the coriander and black peppercorns in a spice blender (or coffee grinder) and pulse once or twice to leave a course grind. (If a spice grinder isn't available, place the toasted coriander and peppercorns in a zip lock bag and crush lightly with a frying pan or rubber mallet). Add the course ground coriander, black peppercorns, red pepper flakes, and agave syrup to a small sauce pot. Heat the pot over low heat for 5 minutes, to infuse the syrup with the spices. Heat a grill to 400 degrees. Bring the Bacon to room temperature, and cut the strips in half. Season the scallops with a little sea salt, and pepper. Wrap a piece of bacon around the scallop, but only overlap slightly. Skewer the scallops as you go, so the bacon stays wrapped around the scallop. Skewer four scallops per skewer. Grill the first side of the scallops, then turn over. Begin Basting the scallops with the spiced syrup, being careful not to burn the scallops. If the heat is too high, turn off the burner. Continue to cook the scallops for a total of 7 minutes. Brush any remaining spiced agave syrup over scallops before serving.